Adam Goldstein will see more football this season—as many as 39 NFL games, in every pro stadium—than most people will see in their entire lives. That's ... impressive? I guess. The man quit his job, sold his apartment, and left his girlfriend in England in order to spend an entire season flying around America, trying to catch as many NFL games as he could in 17 weeks. He's burned through $70,000 worth of plane tickets, scalped seats and lord knows how many parking lot hot dogs to get to where he is now. (He plans to be at the Colts-Jaguars game tonight.) He even flew back to London to catch the game at Wembley and managed to sneak in a high school and college game as well. 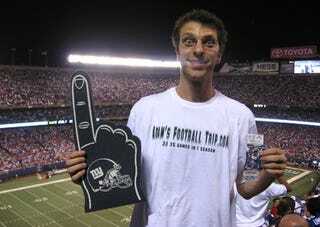 So he's basically bankrupt and stuck in a foreign country, but he's seen a game in every NFL stadium (and the Skydome!) and someone will likely take pity on his story and get him into the Super Bowl. I guess you can't get Sunday Ticket in England. Still, what kind of lunatic does something like this? Oh, he's a Bears fan. Never mind.